For those of you who may be unfamiliar with the riveting, if nauseating, film, ‘Super Size Me’ shone the spotlight on Mickey D’s sleazy and slippery methods of upselling patrons on supersized portions of everything from Coca-Cola and Big Macs to french fries and milk shakes. Spurlock’s flick depicted his decision to live on nothing but three supersized McDonald’s meals a day for one, 30-day period. The side effects were beyond belief. - 35.7 percent of America’s adult population and 16.9 percent of our children qualify as obese, according to the Centers for Disease Control and Prevention. 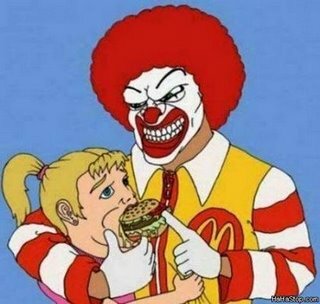 - According to Dr. David Ludwig, director of the childhood obesity program at Children’s Hospital in Boston: “Children will be entering adulthood heavier than they’ve ever been in human history.” I’m not suggesting Skinner, or McDonald’s, are singlehandedly responsible for America’s obesity problem, but I would list them (and, their clown mascot, Ronald) as public enemy numbers one, two and three, respectively. All that said, I do wish Mr. Skinner well in his retirement and hope that, despite ingesting all the horrific, calorie-laden food his restaurant chain churns out, he lives long enough to enjoy a Big Mac when he’s a centenarian. Whether I die tomorrow or live to see 100 I’d rather not be remembered solely for my business C.V.
Rather, I’d like people to say, “Steve Cody? Yeah, we knew him. He was a guy who didn’t hesitate to help charities with their fundraising efforts, colleges & universities with their scholarships and people of all ages with their career aspirations.” Of course, they’d say that after first stating the obvious: “Cody? Sure, he and Moed were the guys who built Peppercom from a two-person start-up to a $20mm midsized gem of a business.